This meal makes a quick but flavorful last-minute dinner. Sauté a few chicken breasts (I like them pounded thin for faster, more even cooking), mix 4 ingredients for a tangy herb-infused cream sauce and serve with some fresh vegetables and/or this quick pilaf. 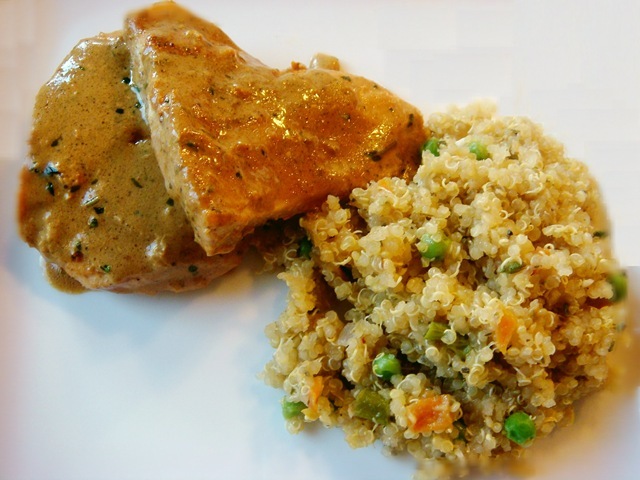 This pilaf uses the grain quinoa (pronounced keen-wah) which has a wonderful chewy, nutty flavor. It can often be substituted in rice dishes. It cooks quickly, about 15 minutes, and is full of nutritious fiber, protein and amino acids. As it is technically not a grain, but a seed, it is also gluten-free. We spent a few weeks eating gluten free as we were doing some food elimination allergy testing, and quinoa was one of my favorite new ingredients. We are back to eating wheat/gluten, but quinoa is here to stay! Place chicken breasts between two pieces of plastic wrap. Pound chicken breasts until thin. (If the chicken breasts are especially large, cut breasts in half crosswise-through entire breast-before pounding) In a large skillet, heat oil over medium-high heat. Add chicken. Sprinkle chicken breasts with salt, pepper and garlic powder. Sauté until cooked through and nicely browned, 10 to 12 minutes, turning once. Sprinkle with salt, pepper and garlic powder again after turning. Transfer to a plate; keep warm. Pour wine into hot skillet; cook, stirring, until almost completely reduced, about 2-3 minutes. Whisk in cream, mustard, and thyme. Cook, whisking, until slightly thickened, about 2 minutes. Return chicken (and any accumulated chicken juices) to skillet. Heat through. Right before serving, pour a little cream sauce on plate. Place chicken on top, and drizzle remaining sauce over chicken. Heat butter in a saucepan. Add onion and garlic (and mushrooms or peppers, if using). Sauté until tender, about 5 minutes. Add rinsed quinoa, broth and seasonings. Bring to a boil. Add longer-cooking vegetables, like carrots or broccoli. Reduce heat, cover, and cook for 15 minutes, adding shorter-cooking vegetables, like asparagus, peas or green onions, 3-4 minutes before end of cooking time. Let stand 5 minutes before serving.